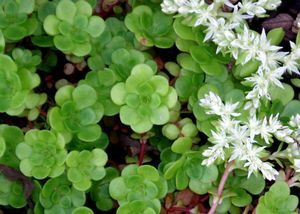 Native plant lovers don’t miss this ground cover Sedum for shade…yes, for shade…with dark green succulent leaves and star-shaped white flowers in May. The 6” thick evergreen foliage is mat forming and will do well up against tree roots, or when allowed to creep in the rock garden. 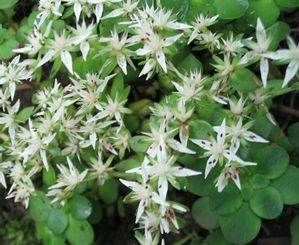 Surprisingly preferring moist soil, this low maintenance gem is for gardeners of all walks.